This species is accepted, and its native range is Alaska to Newfoundland and N. Mexico. 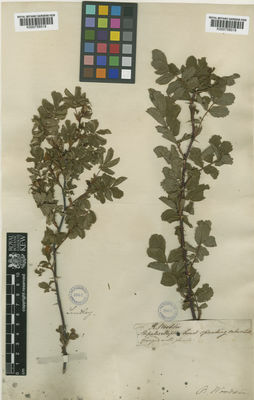 Rosa hypoleuca Wooton & Standl. Rosa woodsii var. fendleri (Crép.) Rydb. Lewis, W.H. & Elvin-Lewis, M. (2017). New records and range extensions for Rosa (Rosaceae) in North America Journal of the Botanical Research Institute of Texas 11: 185-191.